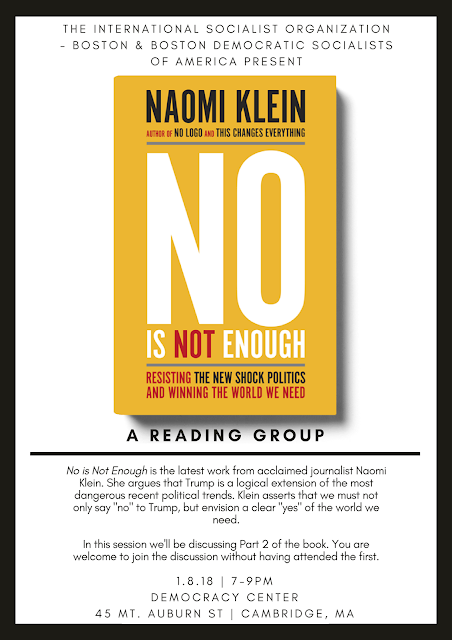 ISO-Boston & Boston Democratic Socialists of America are teaming up to read acclaimed journalist Naomi Klein's latest book No Is Not Enough. This book is an important work which pinpoints Trump not as a deviation from the norm of U.S. politics, but a logical extension of the most dangerous trends of the past half-century. In reading & discussing the book, the ISO & DSA seek to better understand a way forward toward the world we need. Jan. 8 will be the second installment of our study group; we'll be reading Part 2 of the book. You're more than welcome to join us even if you were not able to attend the last session. Visit Haymarket Books to purchase your own copy of the book, or contact the ISO/DSA for one.